"Pavlov's dog" and "Pavlovian" redirect here. For the Pavlovian Upper Paleolithic culture, see Pavlovian culture. For other uses, see Pavlov's dog (disambiguation). Classical conditioning (also known as Pavlovian or respondent conditioning) refers to a learning procedure in which a biologically potent stimulus (e.g. food) is paired with a previously neutral stimulus (e.g. a bell). It also refers to the learning process that results from this pairing, through which the neutral stimulus comes to elicit a response (e.g. salivation) that is usually similar to the one elicited by the potent stimulus. These basic facts, which require many qualifications (see below), were first studied in detail by Ivan Pavlov through experiments with dogs and published in 1897. Together with operant conditioning, classical conditioning became the foundation of behaviorism, a school of psychology which was dominant in the mid-20th century and is still an important influence on the practice of psychological therapy and the study of animal behavior. Classical conditioning is a basic learning process, and its neural substrates are now beginning to be understood. 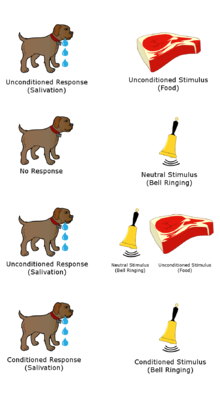 Classical conditioning occurs when a conditioned stimulus (CS) is paired with an unconditioned stimulus (US). Usually, the conditioned stimulus is a neutral stimulus (e.g., the sound of a tuning fork), the unconditioned stimulus is biologically potent (e.g., the taste of food) and the unconditioned response (UR) to the unconditioned stimulus is an unlearned reflex response (e.g., salivation). After pairing is repeated the organism exhibits a conditioned response (CR) to the conditioned stimulus when the conditioned stimulus is presented alone. (A conditioned response may occur after only one pairing.) Thus, unlike the UR, the CR is acquired through experience, and it is also less permanent than the UR. Usually the conditioned response is similar to the unconditioned response, but sometimes it is quite different. For this and other reasons, most learning theorists suggest that the conditioned stimulus comes to signal or predict the unconditioned stimulus, and go on to analyze the consequences of this signal. Robert A. Rescorla provided a clear summary of this change in thinking, and its implications, in his 1988 article "Pavlovian conditioning: It's not what you think it is". Despite its widespread acceptance, Rescorla's thesis may not be defensible. Papini MR, Bitterman ME (July 1990). "The role of contingency in classical conditioning". Psychological Review. 97 (3): 396–403. doi:10.1037/0033-295X.97.3.396. PMID 2200077. 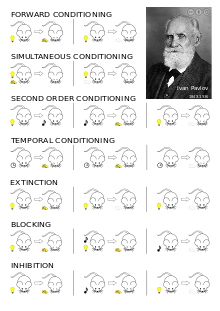 The best-known and most thorough early work on classical conditioning was done by Ivan Pavlov, although Edwin Twitmyer published some related findings a year earlier. During his research on the physiology of digestion in dogs, Pavlov developed a procedure that enabled him to study the digestive processes of animals over long periods of time. He redirected the animal's digestive fluids outside the body, where they could be measured. Pavlov noticed that his dogs began to salivate in the presence of the technician who normally fed them, rather than simply salivating in the presence of food. Pavlov called the dogs' anticipatory salivation "psychic secretion". Putting these informal observations to an experimental test, Pavlov presented a stimulus (e.g. the sound of a metronome) and then gave the dog food; after a few repetitions, the dogs started to salivate in response to the stimulus. Pavlov concluded that if a particular stimulus in the dog's surroundings was present when the dog was given food then that stimulus could become associated with food and cause salivation on its own. In Pavlov's experiments the unconditioned stimulus (US) was the dog food because its effects did not depend on previous experience. The metronome's sound is originally a neutral stimulus (NS) because it does not elicit salivation in the dogs. After conditioning, the metronome's sound becomes the conditioned stimulus (CS) or conditional stimulus; because its effects depend on its association with food. Likewise, the responses of the dog follow the same conditioned-versus-unconditioned arrangement. The conditioned response (CR) is the response to the conditioned stimulus, whereas the unconditioned response (UR) corresponds to the unconditioned stimulus. Pavlov reported many basic facts about conditioning; for example, he found that learning occurred most rapidly when the interval between the CS and the appearance of the US was relatively short. As noted earlier, it is often thought that the conditioned response is a replica of the unconditioned response, but Pavlov noted that saliva produced by the CS differs in composition from that produced by the US. In fact, the CR may be any new response to the previously neutral CS that can be clearly linked to experience with the conditional relationship of CS and US. It was also thought that repeated pairings are necessary for conditioning to emerge, but many CRs can be learned with a single trial, especially in fear conditioning and taste aversion learning. Diagram representing forward conditioning. The time interval increases from left to right. Learning is fastest in forward conditioning. During forward conditioning, the onset of the CS precedes the onset of the US in order to signal that the US will follow. :69 Two common forms of forward conditioning are delay and trace conditioning. Delay conditioning: In delay conditioning, the CS is presented and is overlapped by the presentation of the US. For example, if a person hears a buzzer for five seconds, during which time air is puffed into their eye, the person will blink. After several pairings of the buzzer and the puff, the person will blink at the sound of the buzzer alone. This is delay conditioning. Trace conditioning: During trace conditioning, the CS and US do not overlap. Instead, the CS begins and ends before the US is presented. The stimulus-free period is called the trace interval or the conditioning interval. If in the above buzzer example, the puff came a second after the sound of the buzzer stopped, that would be trace conditioning, with a trace or conditioning interval of one second. During simultaneous conditioning, the CS and US are presented and terminated at the same time. For example: If a person hears a bell and has air puffed into their eye at the same time, and repeated pairings like this lead to the person blinking when they hear the bell despite the puff of air being absent, this demonstrates that simultaneous conditioning has occurred. Second-order or higher-order conditioning follow a two-step procedure. First a neutral stimulus ("CS1") comes to signal a US through forward conditioning. Then a second neutral stimulus ("CS2") is paired with the first (CS1) and comes to yield its own conditioned response. :66 For example: A bell might be paired with food until the bell elicits salivation. If a light is then paired with the bell, then the light may come to elicit salivation as well. The bell is the CS1 and the food is the US. The light becomes the CS2 once it is paired with the CS1. Backward conditioning occurs when a CS immediately follows a US. Unlike the usual conditioning procedure, in which the CS precedes the US, the conditioned response given to the CS tends to be inhibitory. This presumably happens because the CS serves as a signal that the US has ended, rather than as a signal that the US is about to appear. :71 For example, a puff of air directed at a person's eye could be followed by the sound of a buzzer. In temporal conditioning, a US is presented at regular intervals, for instance every 10 minutes. Conditioning is said to have occurred when the CR tends to occur shortly before each US. This suggests that animals have a biological clock that can serve as a CS. This method has also been used to study timing ability in animals (see Animal cognition). The example below shows the temporal conditioning, as US such as food to a hungry mouse is simply delivered on a regular time schedule such as every thirty seconds. After sufficient exposure the mouse will begin to salivate just before the food delivery. This then makes it temporal conditioning as it would appear that the mouse is conditioned to the passage of time. (see Basic Principle of Learning). In this procedure, the CS is paired with the US, but the US also occurs at other times. If this occurs, it is predicted that the US is likely to happen in the absence of the CS. In other words, the CS does not "predict" the US. In this case, conditioning fails and the CS does not come to elicit a CR. This finding – that prediction rather than CS-US pairing is the key to conditioning – greatly influenced subsequent conditioning research and theory. In the extinction procedure, the CS is presented repeatedly in the absence of a US. This is done after a CS has been conditioned by one of the methods above. When this is done, the CR frequency eventually returns to pre-training levels. However, extinction does not completely eliminate the effects of the prior conditioning. This is demonstrated by spontaneous recovery – when there is a sudden appearance of the (CR) after extinction occurs – and other related phenomena (see "Recovery from extinction" below). These phenomena can be explained by postulating accumulation of inhibition when a weak stimulus is presented. During acquisition, the CS and US are paired as described above. The extent of conditioning may be tracked by test trials. In these test trials, the CS is presented alone and the CR is measured. A single CS-US pairing may suffice to yield a CR on a test, but usually a number of pairings are necessary and there is a gradual increase in the conditioned response to the CS. This repeated number of trials increase the strength and/or frequency of the CR gradually. The speed of conditioning depends on a number of factors, such as the nature and strength of both the CS and the US, previous experience and the animal's motivational state. The process slows down as it nears completion. If the CS is presented without the US, and this process is repeated continuously, the CS will eventually stop eliciting a CR. This means that the CR has been "extinguished". This occurs due to a temporal sensitive relationship between the US and CS. The cessation or long temporal delay of CS-US pairing results in a learned decision to stop responding to a CS since there is a sufficient change in the rate at which the CS is being reinforced. External inhibition may be observed if a strong or unfamiliar stimulus is presented just before, or at the same time as, the CS. This causes a reduction in the conditioned response to the CS. Reacquisition: If the CS is again paired with the US, a CR is again acquired, but this second acquisition usually happens much faster than the first one. Spontaneous recovery: Spontaneous recovery is defined as the reappearance of a previously extinguished conditioned response after a rest period. That is, if the CS is tested at a later time (for example an hour or a day) after extinction it will again elicit a CR. This renewed CR is usually much weaker than the CR observed prior to extinction. Disinhibition: If the CS is tested just after extinction and an intense but associatively neutral stimulus has occurred, there may be a temporary recovery of the conditioned response to the CS. Reinstatement: If the US used in conditioning is presented to a subject in the same place where conditioning and extinction occurred, but without the CS being present, the CS often elicits a response when it is tested later. Renewal: Renewal is a reemergence of a conditioned response following extinction when an animal is returned to the environment in which the conditioned response was acquired. Stimulus generalization is said to occur if, after a particular CS has come to elicit a CR, another similar stimulus will elicit the same CR. Usually the more similar the CS and the test stimulus are, the stronger the CR to the test stimulus. The more the test stimulus differs from the CS, the weaker the CR will be, or the more it will differ from that previously observed. One observes stimulus discrimination when one stimulus ("CS1") elicits one CR and another stimulus ("CS2") elicits either another CR or no CR at all. This can be brought about by, for example, pairing CS1 with an effective US and presenting CS2 with no US. Latent inhibition refers to the observation that it takes longer for a familiar stimulus to become a CS than it does for a novel stimulus to become a CS, when the stimulus is subsequently paired with an effective US. Typically, three phases of conditioning are used. CS+/US trials are continued, but these are interspersed with trials on which the CS+ is paired with a second CS, (the CS-) but not with the US (i.e. CS+/CS- trials). Typically, organisms show CRs on CS+/US trials, but stop responding on CS+/CS− trials. Experiments on theoretical issues in conditioning have mostly been done on vertebrates, especially rats and pigeons. However, conditioning has also been studied in invertebrates, and very important data on the neural basis of conditioning has come from experiments on the sea slug, Aplysia. Most relevant experiments have used the classical conditioning procedure, although instrumental (operant) conditioning experiments have also been used, and the strength of classical conditioning is often measured through its operant effects, as in conditioned suppression (see Phenomena section above) and autoshaping. The Rescorla-Wagner model argues that there is a limit to the amount of conditioning that can occur in the pairing of two stimuli. One determinant of this limit is the nature of the US. For example: pairing a bell with a juicy steak is more likely to produce salivation than pairing the bell with a piece of dry bread, and dry bread is likely to work better than a piece of cardboard. A key idea behind the R–W model is that a CS signals or predicts the US. One might say that before conditioning, the subject is surprised by the US. However, after conditioning, the subject is no longer surprised, because the CS predicts the coming of the US. (Note that the model can be described mathematically and that words like predict, surprise, and expect are only used to help explain the model.) Here the workings of the model are illustrated with brief accounts of acquisition, extinction, and blocking. The model also predicts a number of other phenomena, see main article on the model. This is the Rescorla-Wagner equation. It specifies the amount of learning that will occur on a single pairing of a conditioning stimulus (CS) with an unconditioned stimulus (US). The above equation is solved repeatedly to predict the course of learning over many such trials. The R–W model measures conditioning by assigning an "associative strength" to the CS and other local stimuli. Before a CS is conditioned it has an associative strength of zero. Pairing the CS and the US causes a gradual increase in the associative strength of the CS. This increase is determined by the nature of the US (e.g. its intensity). :85–89 The amount of learning that happens during any single CS-US pairing depends on the difference between the total associative strengths of CS and other stimuli present in the situation (ΣV in the equation), and a maximum set by the US (λ in the equation). On the first pairing of the CS and US, this difference is large and the associative strength of the CS takes a big step up. As CS-US pairings accumulate, the US becomes more predictable, and the increase in associative strength on each trial becomes smaller and smaller. Finally the difference between the associative strength of the CS (plus any that may accrue to other stimuli) and the maximum strength reaches zero. That is, the US is fully predicted, the associative strength of the CS stops growing, and conditioning is complete. The associative process described by the R–W model also accounts for extinction (see "procedures" above). The extinction procedure starts with a positive associative strength of the CS, which means that the CS predicts that the US will occur. On an extinction trial the US fails to occur after the CS. As a result of this “surprising” outcome, the associative strength of the CS takes a step down. Extinction is complete when the strength of the CS reaches zero; no US is predicted, and no US occurs. However, if that same CS is presented without the US but accompanied by a well-established conditioned inhibitor (CI), that is, a stimulus that predicts the absence of a US (in R-W terms, a stimulus with a negative associate strength) then R-W predicts that the CS will not undergo extinction (its V will not decrease in size). The R–W explanation of the blocking phenomenon illustrates one consequence of the assumption just stated. In blocking (see "phenomena" above), CS1 is paired with a US until conditioning is complete. Then on additional conditioning trials a second stimulus (CS2) appears together with CS1, and both are followed by the US. Finally CS2 is tested and shown to produce no response because learning about CS2 was “blocked” by the initial learning about CS1. The R–W model explains this by saying that after the initial conditioning, CS1 fully predicts the US. Since there is no difference between what is predicted and what happens, no new learning happens on the additional trials with CS1+CS2, hence CS2 later yields no response. One of the main reasons for the importance of the R–W model is that it is relatively simple and makes clear predictions. Tests of these predictions have led to a number of important new findings and a considerably increased understanding of conditioning. Some new information has supported the theory, but much has not, and it is generally agreed that the theory is, at best, too simple. However, no single model seems to account for all the phenomena that experiments have produced. Following are brief summaries of some related theoretical issues. Latent inhibition: If a subject is repeatedly exposed to the CS before conditioning starts, then conditioning takes longer. The R–W model cannot explain this because preexposure leaves the strength of the CS unchanged at zero. Latent inhibition might happen because a subject stops focusing on a CS that is seen frequently before it is paired with a US. In fact, changes in attention to the CS are at the heart of two prominent theories that try to cope with experimental results that give the R–W model difficulty. In one of these, proposed by Nicholas Mackintosh, the speed of conditioning depends on the amount of attention devoted to the CS, and this amount of attention depends in turn on how well the CS predicts the US. Pearce and Hall proposed a related model based on a different attentional principle Both models have been extensively tested, and neither explains all the experimental results. Consequently, various authors have attempted hybrid models that combine the two attentional processes. Pearce and Hall in 2010 integrated their attentional ideas and even suggested the possibility of incorporating the Rescorla-Wagner equation into an integrated model. As stated earlier, a key idea in conditioning is that the CS signals or predicts the US (see "zero contingency procedure" above). However, for example, the room in which conditioning takes place also "predicts" that the US may occur. Still, the room predicts with much less certainty than does the experimental CS itself, because the room is also there between experimental trials, when the US is absent. 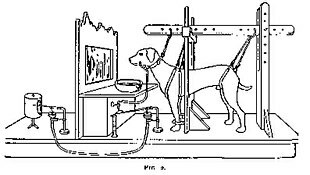 The role of such context is illustrated by the fact that the dogs in Pavlov's experiment would sometimes start salivating as they approached the experimental apparatus, before they saw or heard any CS. Such so-called "context" stimuli are always present, and their influence helps to account for some otherwise puzzling experimental findings. The associative strength of context stimuli can be entered into the Rescorla-Wagner equation, and they play an important role in the comparator and computational theories outlined below. To find out what has been learned, we must somehow measure behavior ("performance") in a test situation. However, as students know all too well, performance in a test situation is not always a good measure of what has been learned. As for conditioning, there is evidence that subjects in a blocking experiment do learn something about the "blocked" CS, but fail to show this learning because of the way that they are usually tested. "Comparator" theories of conditioning are "performance based", that is, they stress what is going on at the time of the test. In particular, they look at all the stimuli that are present during testing and at how the associations acquired by these stimuli may interact. To oversimplify somewhat, comparator theories assume that during conditioning the subject acquires both CS-US and context-US associations. At the time of the test, these associations are compared, and a response to the CS occurs only if the CS-US association is stronger than the context-US association. After a CS and US are repeatedly paired in simple acquisition, the CS-US association is strong and the context-US association is relatively weak. This means that the CS elicits a strong CR. In “zero contingency” (see above), the conditioned response is weak or absent because the context-US association is about as strong as the CS-US association. Blocking and other more subtle phenomena can also be explained by comparator theories, though, again, they cannot explain everything. An organism's need to predict future events is central to modern theories of conditioning. Most theories use associations between stimuli to take care of these predictions. For example: In the R–W model, the associative strength of a CS tells us how strongly that CS predicts a US. A different approach to prediction is suggested by models such as that proposed by Gallistel & Gibbon (2000, 2002). Here the response is not determined by associative strengths. Instead, the organism records the times of onset and offset of CSs and USs and uses these to calculate the probability that the US will follow the CS. A number of experiments have shown that humans and animals can learn to time events (see Animal cognition), and the Gallistel & Gibbon model yields very good quantitative fits to a variety of experimental data. However, recent studies have suggested that duration-based models cannot account for some empirical findings as well as associative models. The Rescorla-Wagner model treats a stimulus as a single entity, and it represents the associative strength of a stimulus with one number, with no record of how that number was reached. As noted above, this makes it hard for the model to account for a number of experimental results. More flexibility is provided by assuming that a stimulus is internally represented by a collection of elements, each of which may change from one associative state to another. For example, the similarity of one stimulus to another may be represented by saying that the two stimuli share elements in common. These shared elements help to account for stimulus generalization and other phenomena that may depend upon generalization. Also, different elements within the same set may have different associations, and their activations and associations may change at different times and at different rates. This allows element-based models to handle some otherwise inexplicable results. A prominent example of the element approach is the “SOP” model of Wagner. The model has been elaborated in various ways since its introduction, and it can now account in principle for a very wide variety of experimental findings. The model represents any given stimulus with a large collection of elements. The time of presentation of various stimuli, the state of their elements, and the interactions between the elements, all determine the course of associative processes and the behaviors observed during conditioning experiments. Of the elements that represent a single stimulus at a given moment, some may be in state A1, some in state A2, and some in state I. When a stimulus first appears, some of its elements jump from inactivity I to primary activity A1. From the A1 state they gradually decay to A2, and finally back to I. Element activity can only change in this way; in particular, elements in A2 cannot go directly back to A1. If the elements of both the CS and the US are in the A1 state at the same time, an association is learned between the two stimuli. This means that if, at a later time, the CS is presented ahead of the US, and some CS elements enter A1, these elements will activate some US elements. However, US elements activated indirectly in this way only get boosted to the A2 state. (This can be thought of the CS arousing a memory of the US, which will not be as strong as the real thing.) With repeated CS-US trials, more and more elements are associated, and more and more US elements go to A2 when the CS comes on. This gradually leaves fewer and fewer US elements that can enter A1 when the US itself appears. In consequence, learning slows down and approaches a limit. One might say that the US is “fully predicted” or “not surprising” because almost all of its elements can only enter A2 when the CS comes on, leaving few to form new associations. The model can explain the findings that are accounted for by the Rescorla-Wagner model and a number of additional findings as well. For example, unlike most other models, SOP takes time into account. The rise and decay of element activation enables the model to explain time-dependent effects such as the fact that conditioning is strongest when the CS comes just before the US, and that when the CS comes after the US (“backward conditioning”) the result is often an inhibitory CS. Many other more subtle phenomena are explained as well. A number of other powerful models have appeared in recent years which incorporate element representations. These often include the assumption that associations involve a network of connections between “nodes” that represent stimuli, responses, and perhaps one or more “hidden” layers of intermediate interconnections. Such models make contact with a current explosion of research on neural networks, artificial intelligence and machine learning. Pavlov proposed that conditioning involved a connection between brain centers for conditioned and unconditioned stimuli. His physiological account of conditioning has been abandoned, but classical conditioning continues to be to study the neural structures and functions that underlie learning and memory. Forms of classical conditioning that are used for this purpose include, among others, fear conditioning, eyeblink conditioning, and the foot contraction conditioning of Hermissenda crassicornis, a sea-slug. Both fear and eyeblink conditioning involve a neutral stimulus, frequently a tone, becoming paired with an unconditioned stimulus. In the case of eyeblink conditioning, the US is an air-puff, while in fear conditioning the US is threatening or aversive such as a foot shock. "Available data demonstrate that discrete regions of the cerebellum and associated brainstem areas contain neurons that alter their activity during conditioning – these regions are critical for the acquisition and performance of this simple learning task. It appears that other regions of the brain, including the hippocampus, amygdala, and prefrontal cortex, contribute to the conditioning process, especially when the demands of the task get more complex." Fear and eyeblink conditioning involve generally non overlapping neural circuitry, but share molecular mechanisms. Fear conditioning occurs in the basolateral amygdala, which receives glutaminergic input directly from thalamic afferents, as well as indirectly from prefrontal projections. The direct projections are sufficient for delay conditioning, but in the case of trace conditioning, where the CS needs to be internally represented despite a lack of external stimulus, indirect pathways are necessary. The anterior cingulate is one candidate for intermediate trace conditioning, but the hippocampus may also play a major role. Presynaptic activation of protein kinase A and postsynaptic activation of NMDA receptors and its signal transduction pathway are necessary for conditioning related plasticity. CREB is also necessary for conditioning related plasticity, and it may induce downstream synthesis of proteins necessary for this to occur. As NMDA receptors are only activated after an increase in presynaptic calcium(thereby releasing the Mg2+ block), they are a potential coincidence detector that could mediate spike timing dependent plasticity. STDP constrains LTP to situations where the CS predicts the US, and LTD to the reverse. Some therapies associated with classical conditioning are aversion therapy, systematic desensitization and flooding. Aversion therapy is a type of behavior therapy designed to make patients cease an undesirable habit by associating the habit with a strong unpleasant unconditioned stimulus. :336 For example, a medication might be used to associate the taste of alcohol with stomach upset. Systematic desensitization is a treatment for phobias in which the patient is trained to relax while being exposed to progressively more anxiety-provoking stimuli (e.g. angry words). This is an example of counterconditioning, intended to associate the feared stimuli with a response (relaxation) that is incompatible with anxiety:136 Flooding is a form of desensitization that attempts to eliminate phobias and anxieties by repeated exposure to highly distressing stimuli until the lack of reinforcement of the anxiety response causes its extinction. :133 "Flooding" usually involves actual exposure to the stimuli, whereas the term "implosion" refers to imagined exposure, but the two terms are sometimes used synonymously. Conditioning therapies usually take less time than humanistic therapies. The influence of classical conditioning can be seen in emotional responses such as phobia, disgust, nausea, anger, and sexual arousal. A familiar example is conditioned nausea, in which the CS is the sight or smell of a particular food that in the past has resulted in an unconditioned stomach upset. Similarly, when the CS is the sight of a dog and the US is the pain of being bitten, the result may be a conditioned fear of dogs. An example of conditioned emotional response is conditioned suppression. Pavlovian-instrumental transfer is a phenomenon that occurs when a conditioned stimulus (CS, also known as a "cue") that has been associated with rewarding or aversive stimuli via classical conditioning alters motivational salience and operant behavior. In a typical experiment, a rat is presented with sound-food pairings (classical conditioning). Separately, the rat learns to press a lever to get food (operant conditioning). Test sessions now show that the rat presses the lever faster in the presence of the sound than in silence, although the sound has never been associated with lever pressing. Pavlovian-instrumental transfer is suggested to play a role in the differential outcomes effect, a procedure which enhances operant discrimination by pairing stimuli with specific outcomes. In the 1932 novel Brave New World by Aldous Huxley, conditioning plays a key role in the maintenance of social peace, especially in maintaining the caste system upon which society is based. Another example is in Anthony Burgess' 1962 dystopian novel A Clockwork Orange in which the novel's anti-hero and protagonist, Alex, undergoes a procedure called the Ludovico technique, where he is fed a solution to cause severe nausea and then forced to watch violent acts. This renders him unable to perform any violent acts without inducing similar nausea. Unintentionally, he also forms an aversion to classical music. Some general examples that involve the classical conditioning theory in action include, in a lot of cases, advertising. This is a tactic used in order to elicit a response. Advertising on game shows is one of many examples. With the exciting and positive environment of a game show, the viewer may then start to generate an exciting response to the advertisement because of the association with the environment. Another example, very similar to Pavlov's experiment, involves food. Every time a person goes into the kitchen, they begin to feel hungry. This can also relate to eating certain foods while watching a scary movie turning into associating terror with the food that was being consumed at the times of watching the movie. Any type of music, such as Christmas music, that triggers certain sweet memories are related to classical conditioning as well. ^ Cherry K. "What Is a Conditioned Response?". About.com Guide. About.com. Retrieved 2013-02-10. ^ a b c d e f g h Shettleworth SJ (2010). Cognition, Evolution, and Behavior (2nd ed.). Oxford University Press. ^ a b Rescorla RA (March 1988). "Pavlovian conditioning. It's not what you think it is" (PDF). The American Psychologist. 43 (3): 151–60. CiteSeerX 10.1.1.156.1219. doi:10.1037/0003-066X.43.3.151. PMID 3364852. ^ a b c d e f g h i j k l Bouton ME (2016). Learning and Behavior: A Contemporary Synthesis (2nd ed.). Sunderland, MA: Sinauer. ^ Medin DL, Ross BH, Markmen AB (2009). Cognitive Psychology. pp. 50–53. ^ Brink TL (2008). "Unit 6: Learning" (PDF). Psychology: A Student Friendly Approach. pp. 97–98. ^ a b Chang RC, Stout S, Miller RR (January 2004). "Comparing excitatory backward and forward conditioning". The Quarterly Journal of Experimental Psychology. B, Comparative and Physiological Psychology. 57 (1): 1–23. doi:10.1080/02724990344000015. PMID 14690847. ^ a b c d e f g h Chance P (2008). Learning and Behavior. Belmont/CA: Wadsworth. ISBN 978-0-495-09564-4. ^ Rescorla RA (January 1967). "Pavlovian conditioning and its proper control procedures" (PDF). Psychological Review. 74 (1): 71–80. doi:10.1037/h0024109. PMID 5341445. ^ a b Schacter DL (2009). Psychology. Catherine Woods. p. 267. ISBN 978-1-4292-3719-2. ^ Chan CK, Harris JA (August 2017). "Extinction of Pavlovian conditioning: The influence of trial number and reinforcement history". Behavioural Processes. SQAB 2016: Persistence and Relapse. 141 (Pt 1): 19–25. doi:10.1016/j.beproc.2017.04.017. PMID 28473250. ^ Rescorla RA, Wagner AR (1972). "A theory of Pavlovan conditioning: Variations in the effectiveness of reinforcement and nonreinforcement.". In Black AH, Prokasy WF (eds.). Classical Conditioning II: Current Theory and Research. New York: Appleton-Century. pp. 64–99. ^ a b c d Miller R, Escobar M (2004-02-05). "Learning: Laws and Models of Basic Conditioning". In Pashler H, Gallistel R (eds.). Stevens' Handbook of Experimental Psychology. 3: Learning, Motivation & Emotion (3rd ed.). New York: Wiley. pp. 47–102. ISBN 978-0-471-65016-4. ^ Miller RR, Barnet RC, Grahame NJ (May 1995). "Assessment of the Rescorla-Wagner model". Psychological Bulletin. 117 (3): 363–86. doi:10.1037/0033-2909.117.3.363. PMID 7777644. ^ Mackintosh NJ (1975). "A theory of attention: Variations in the associability of stimuli with reinforcement". Psychological Review. 82 (4): 276–298. CiteSeerX 10.1.1.556.1688. doi:10.1037/h0076778. ^ Pearce JM, Hall G (November 1980). "A model for Pavlovian learning: variations in the effectiveness of conditioned but not of unconditioned stimuli". Psychological Review. 87 (6): 532–52. doi:10.1037/0033-295X.87.6.532. PMID 7443916. ^ Gibbon J, Balsam P (1981). "Spreading association in time.". In Locurto CM, Terrace HS, Gibbon J (eds.). Autoshaping and conditioning theory. New York: Academic Press. pp. 219–235. ^ Miller RR, Escobar M (August 2001). "Contrasting acquisition-focused and performance-focused models of acquired behavior". Current Directions in Psychological Science. 10 (4): 141–5. doi:10.1111/1467-8721.00135. ^ Gallistel CR, Gibbon J (April 2000). "Time, rate, and conditioning" (PDF). Psychological Review. 107 (2): 289–344. CiteSeerX 10.1.1.407.1802. doi:10.1037/0033-295X.107.2.289. PMID 10789198. ^ Gallistel R, Gibbon J (2002). The Symbolic Foundations of Conditioned Behavior. Mahwah, NJ: Erlbaum. ^ Golkar A, Bellander M, Öhman A (February 2013). "Temporal properties of fear extinction--does time matter?". Behavioral Neuroscience. 127 (1): 59–69. doi:10.1037/a0030892. PMID 23231494. ^ Wagner AR (1981). "SOP: A model of automatic memory processing in animal behavior.". In Spear NE, Miller RR (eds.). Information processing in animals: Memory mechanisms. Hillsdale, NJ: Erlbaum. pp. 5–47. ISBN 978-1-317-75770-2. ^ Steinmetz JE (2010). "Neural Basis of Classical Conditioning". Encyclopedia of Behavioral Neuroscience. Academic Press. pp. 313–319. ^ Fanselow MS, Poulos AM (February 2005). "The neuroscience of mammalian associative learning". Annual Review of Psychology. 56 (1): 207–34. doi:10.1146/annurev.psych.56.091103.070213. PMID 15709934. ^ Markram H, Gerstner W, Sjöström PJ (2011). "A history of spike-timing-dependent plasticity". Frontiers in Synaptic Neuroscience. 3: 4. doi:10.3389/fnsyn.2011.00004. PMC 3187646. PMID 22007168. ^ a b c Kearney CA (January 2011). Abnormal Psychology and Life: A Dimensional Approach. ^ McGee DL (2006). "Behavior Modification". Wellness.com, Inc. Retrieved 14 February 2012. ^ Carlson NR (2010). Psychology: The Science of Behaviour. New Jersey, United States: Pearson Education Inc. pp. 599–604. ISBN 978-0-205-64524-4. ^ Carlson NR (2010). Psychology: The Science of Behaviour. New Jersey, United States: Pearson Education Inc. pp. 198–203. ISBN 978-0-205-64524-4. ^ Cartoni E, Puglisi-Allegra S, Baldassarre G (November 2013). "The three principles of action: a Pavlovian-instrumental transfer hypothesis". Frontiers in Behavioral Neuroscience. 7: 153. doi:10.3389/fnbeh.2013.00153. PMC 3832805. PMID 24312025. ^ Geurts DE, Huys QJ, den Ouden HE, Cools R (September 2013). "Aversive Pavlovian control of instrumental behavior in humans" (PDF). Journal of Cognitive Neuroscience. 25 (9): 1428–41. doi:10.1162/jocn_a_00425. PMID 23691985. ^ Cartoni E, Balleine B, Baldassarre G (December 2016). "Appetitive Pavlovian-instrumental Transfer: A review". Neuroscience and Biobehavioral Reviews. 71: 829–848. doi:10.1016/j.neubiorev.2016.09.020. PMID 27693227. This paper reviews one of the experimental paradigms used to study the effects of cues, the Pavlovian to Instrumental Transfer paradigm. In this paradigm, cues associated with rewards through Pavlovian conditioning alter motivation and choice of instrumental actions. ... Predictive cues are an important part of our life that continuously influence and guide our actions. Hearing the sound of a horn makes us stop before we attempt to cross the street. Seeing an advertisement for fast food might make us hungry and lead us to seek out a specific type and source of food. In general, cues can both prompt us towards or stop us from engaging in a certain course of action. They can be adaptive (saving our life in crossing the street) or maladaptive, leading to suboptimal choices, e.g. making us eat when we are not really hungry (Colagiuri and Lovibond, 2015). In extreme cases they can even play a part in pathologies such as in addiction, where drug associated cues produce craving and provoke relapse (Belin et al., 2009). A brief CS encounter (or brief UCS encounter) often primes a pulse of elevated motivation to obtain and consume more reward UCS. This is a signature feature of incentive salience. In daily life, the smell of food may make you suddenly feel hungry, when you hadn’t felt that way a minute before. In animal neuroscience experiments, a CS for reward may trigger a more frenzied pulse of increased instrumental efforts to obtain that associated UCS reward in situations that purify the measurement of incentive salience, such as in Pavlovian-Instrumental Transfer (PIT) experiments ... Similarly, including a CS can often spur increased consumption of a reward UCS by rats or people, compared to consumption of the same UCS when CSs are absent ... Thus Pavlovian cues can elicit pulses of increased motivation to consume their UCS reward, whetting and intensifying the appetite. However, the motivation power is never simply in the cues themselves or their associations, since cue-triggered motivation can be easily modulated and reversed by drugs, hungers, satieties, etc., as discussed below. Dayan P, Kakade S, Montague PR (November 2000). "Learning and selective attention". Nature Neuroscience. 3 Suppl: 1218–23. doi:10.1038/81504. PMID 11127841. Jami SA, Wright WG, Glanzman DL (March 2007). "Differential classical conditioning of the gill-withdrawal reflex in Aplysia recruits both NMDA receptor-dependent enhancement and NMDA receptor-dependent depression of the reflex". The Journal of Neuroscience. 27 (12): 3064–8. doi:10.1523/JNEUROSCI.2581-06.2007. PMID 17376967. Kirsch I, Lynn SJ, Vigorito M, Miller RR (April 2004). "The role of cognition in classical and operant conditioning". Journal of Clinical Psychology. 60 (4): 369–92. doi:10.1002/jclp.10251. PMID 15022268. Pavlov IP (1927). Translated by Anrep GV. "Conditioned Reflexes: An Investigation of the Physiological Activity of the Cerebral Cortex". Nature. 121 (3052): 662–664. Bibcode:1928Natur.121..662D. doi:10.1038/121662a0. Rescorla RA, Wagner AR (1972). "A theory of Pavlovian conditioning. Variations in effectiveness of reinforcement and non-reinforcement.". In Black A, Prokasky WF (eds.). Classical Conditioning II. New York: Appleton-Century-Crofts. Schmidt RF (1989). "Behavior Memory (Learning by Conditioning)". In Schmidt RF, Thews G (eds.). Human Physiology. Translated by Marguerite A. Biederman-Thorson (Second, completely revised ed.). Berlin etc. : Springer-Verlag. pp. 155–156. ISBN 978-3-540-19432-3. Chance P (2008). Learning and Behavior. Belmont/CA: Wadsworth. ISBN 978-0-495-09564-4. Moore JW (2012). A Neuroscientist's Guide to Classical Conditioning. Springer Science & Business Media. ISBN 978-0387988054. Medin DL, Ross BH, Markman AB (2009). Cognitive Psychology. Kearney CA (January 2011). Abnormal Psychology and Life: A Dimensional Approach. Hilgard ER, Marquis DG (1961). Hilgard and Marquis' Conditioning and learning. New York: Appleton-Century-Crofts. Razran G (1971). Mind in evolution; an East-West synthesis of learned behavior and cognition. Boston: Houghton Mifflin. Black AH, Prokasy WF (1972). Classical conditioning II: current research and theory. Appleton-Century-Crofts. Wikimedia Commons has media related to Classical conditioning.